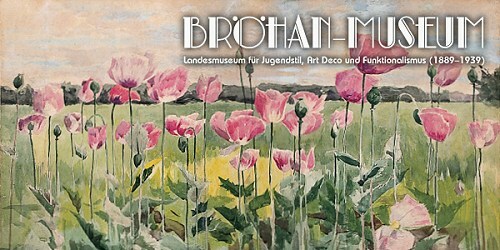 We recently discovered the Brohan Museum, an international specialist and period Museum of Art Nouveau , Art Deco and Functionalism (1889-1939) . The museum’s holdings are divided into two main areas: arts and crafts and fine arts. art objects as space ensembles. A Special exhibition: Hans Christiansen – a retrospective commence on February 19 and continue to May 24, 2015. Hans Christiansen (1866-1945) is one of the most versatile artists of Art Nouveau. He spent formative years in Hamburg and Paris, before being appointed to Darmstadt. By Joseph Maria Olbrich and Peter Behrens he belonged there to the first seven members of the artists’ colony Mathildenhöhe. He became known with his cover illustrations for the magazine “Youth”, which has given the movement in Germany its name. In the spirit of the time, he saw himself as a great artist. The first retrospective ever to Hans Christiansen shows the whole range of his work: On display are paintings, posters, tapestries, glassware, ceramics, jewelry, stained glass windows, cutlery and furniture ensemble. An exhibition catalog has been published.